Coffee is a beverage that’s universally beloved (and obsessed over) by people of all nations. You don’t need to speak the same language to appreciate the comfort of a steamy cup of Joe on a bitterly cold winter morning. Worshipping the same God isn’t a prerequisite for experiencing the always faithful boost of energy an espresso can provide at any hour, day or night. For centuries, coffee has been a come-as-you-are kind of beverage, a conduit for communication and connection whether the person sitting across from you is considered a friend, family member, stranger or foe. 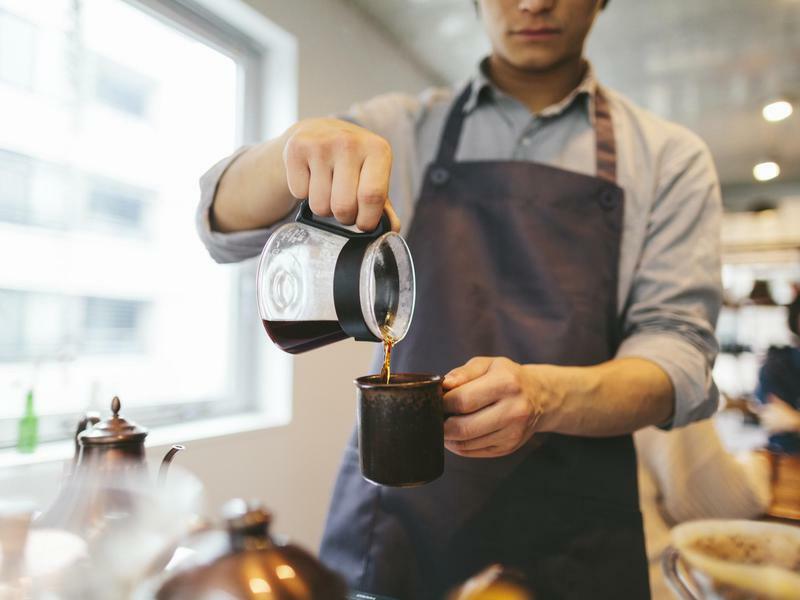 No matter where you roam in the world, coffee is most likely a given — which is why it’s essential, especially for caffeine diehards, to understand the customs and rules that govern a peoples’ coffee culture. Here’s how countries around the world get their caffeine fix. According to legend, café de olla was born during the Mexican revolution of 1910. Cinnamon and piloncillo (unrefined sugar) were mixed with coffee, which was then steeped in clay pots over an open fire and served to soldiers in need of an energizing caffeine boost. 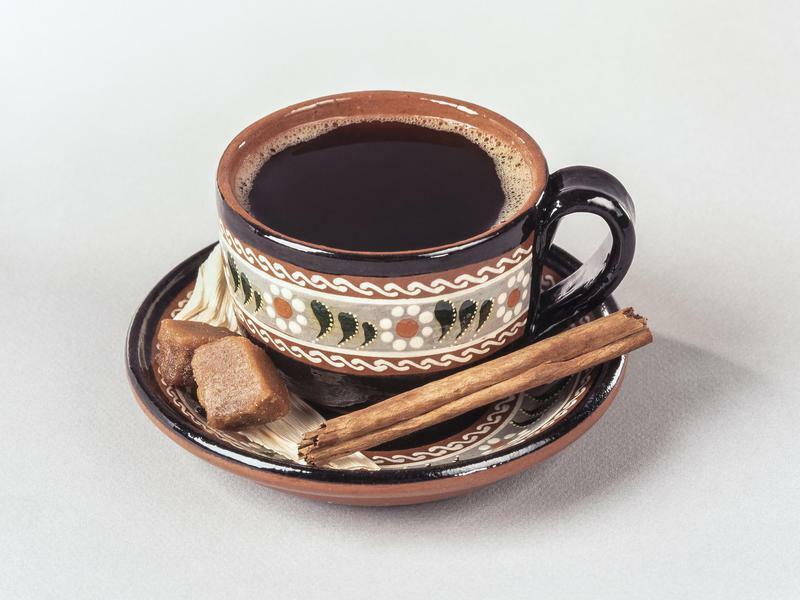 Since then, café de olla has retired from the battlefield and become an honored tradition in Mexican culture. Today, in addition to cinnamon, café de olla is often prepared with orange peel, star anise and clove, making for a truly intoxicating blend. Café de olla traditionalists still insist on brewing the coffee in earthen clay, but in modern times a metal pot with a sturdy handle will suffice. India’s coffee fate was sealed in the 17th century when Sufi saint Baba Budan, while on a pilgrimage to Mecca, smuggled a handful of coffee beans from Yemen’s port city of Mocha back to Karnataka, India. Upon his return, Budan planted the beans; as the story goes, he had exactly seven, which was all it took for coffee plants to sprout up all over a mountain range, making coffee plentiful in Southern India. For an authentic cup, boiled water is poured over coffee grounds packed into a filter. This process creates a decoction, a concentrated mix of coffee that drips through the filter and into a cup. 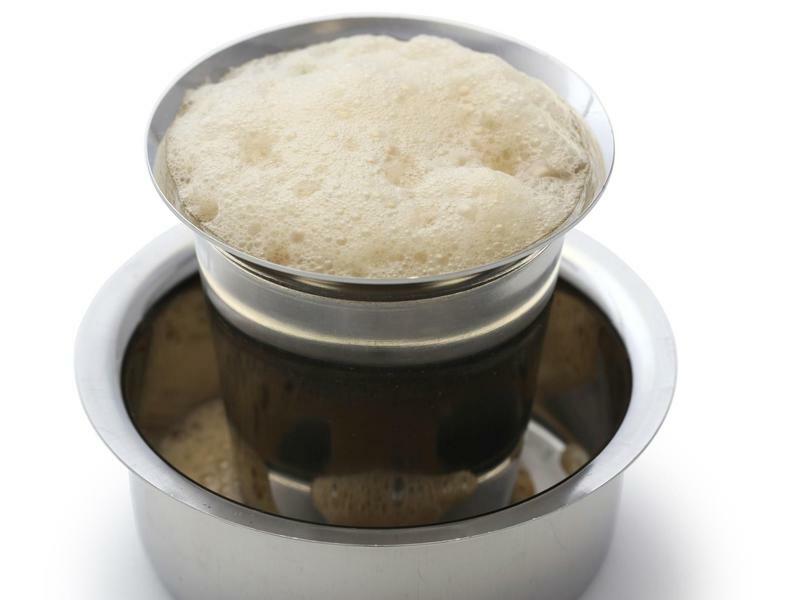 Once the coffee becomes thick, boiled whole milk and sugar are added to create the robust brew that Southern India has come to know and love. From Milan to Naples, caffè in Italy is hailed as both an institution and an art form. But to enjoy it properly and avoid getting the stink eye from your barista, a few rules and standards must be obliged. 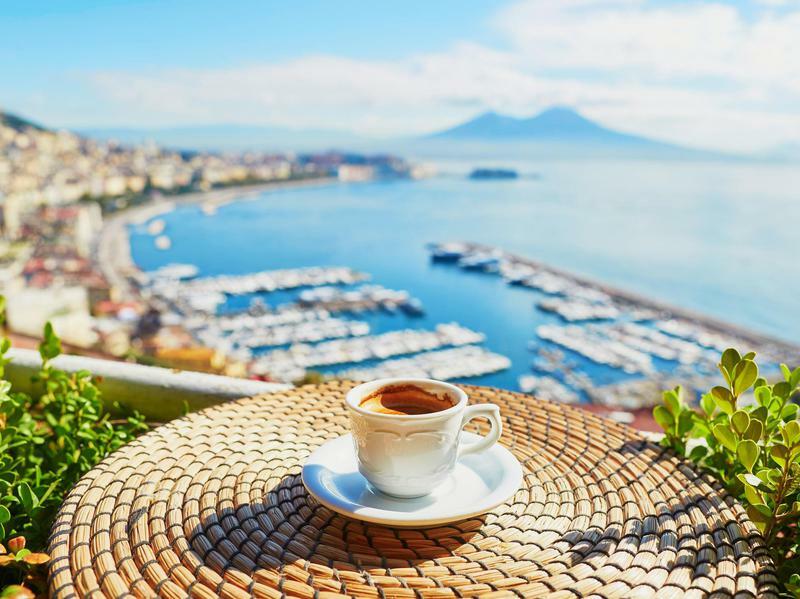 For starters, all coffee in Italy begins and ends with espresso. A standard caffè normale or caffè is served black as a single shot meant to be consumed in one quick gulp while standing. Unlike in the U.S., to-go coffee is not common here, and attempting to order it this way will most likely result in a few discreet eye rolls from nearby locals. Also contrary to coffee culture in The States, the cappuccino — a quintessential Italian drink made of equal parts espresso, milk and foam — should only be enjoyed with breakfast and never after 11 a.m. However, if you’re jonesing for an espresso with a touch of milk, the macchiato is a safe choice, and like espresso, it’s generally considered acceptable to order throughout the day. Wake up in France, and you’ll most likely start your day with a tartine, a toasted baguette served with butter and jam. And you’ll probably wash it down with a creamy French favorite: the café au lait. A simple combination of coffee and hot milk, the café au lait is traditionally served in a generously sized bowl. As in Italy, it’s considered inappropriate to consume after 10 a.m. 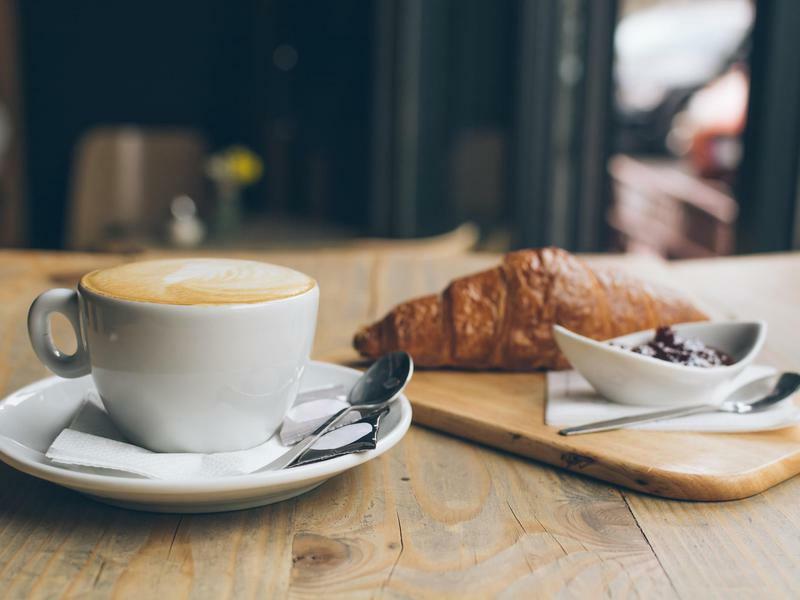 While France often receives bad marks for its coffee, there’s something undeniably Parisian about sitting solo at a bistro table with a café au lait and losing track of the time while watching the city and its people pass you by. Contrary to popular belief, Turkish coffee isn’t precisely Turkish. Rather, it’s an interpretation of coffee preparation that is common in the Arab world. 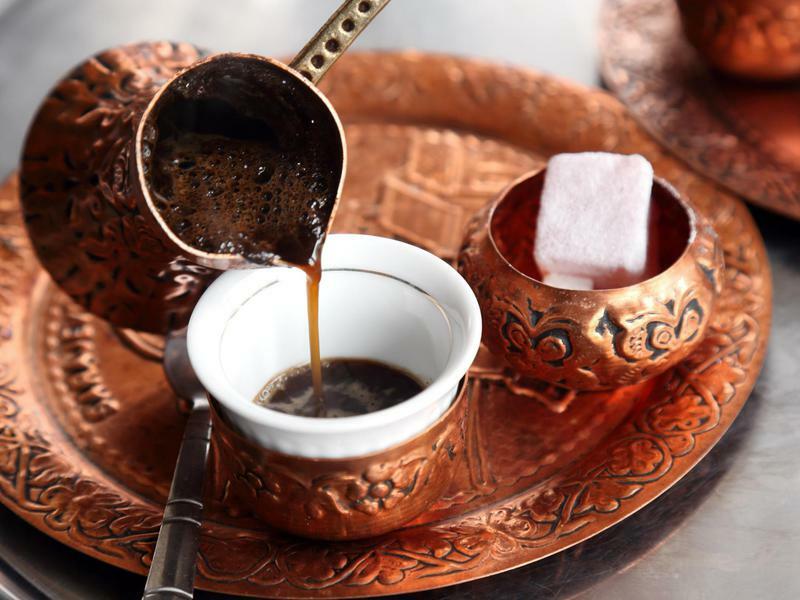 Regardless, Turkish coffee remains an indispensable part of Turkish heritage and culture. No social gathering or special occasion would be complete without a meticulously crafted pot. The brewing process starts with finely ground roasted coffee beans. The beans, along with cold water and sugar, are added to an ibrik, a wide bottomed, long-handled copper coffee pot. This mixture is brought to a boil and then removed from the heat before it’s placed back on the stovetop for a second boil. During this double-boiling process, a caramel colored foam builds on the surface of the coffee, which can be scooped off the top if desired. After cooking, the coffee sits for a few minutes to allow the grounds to settle. At this point, spices such as cardamom or cinnamon can be added for a kick of flavor. Importantly, the coffee grounds remain at the bottom of the cup, and are not meant to be consumed. Instead, the remaining streaks of black sludge can either be tossed or used for fortune telling. Since the 1600s, Japan has slowly been cultivating its passion for coffee. The love affair began during Japan’s self-imposed isolation period, when Dutch traders brought coffee (aka koffie) through Nagasaki. At first, the Japanese disliked the drink, but once the isolation period ended and coffee flooded the island, reaching a wider range of taste buds, coffee experienced a surge in popularity. In recent years, specialty coffee shops in Japan have turned coffee into a distinct art form, cleverly using milk foam to sculpt anime characters, rabbits, kittens and puppies. 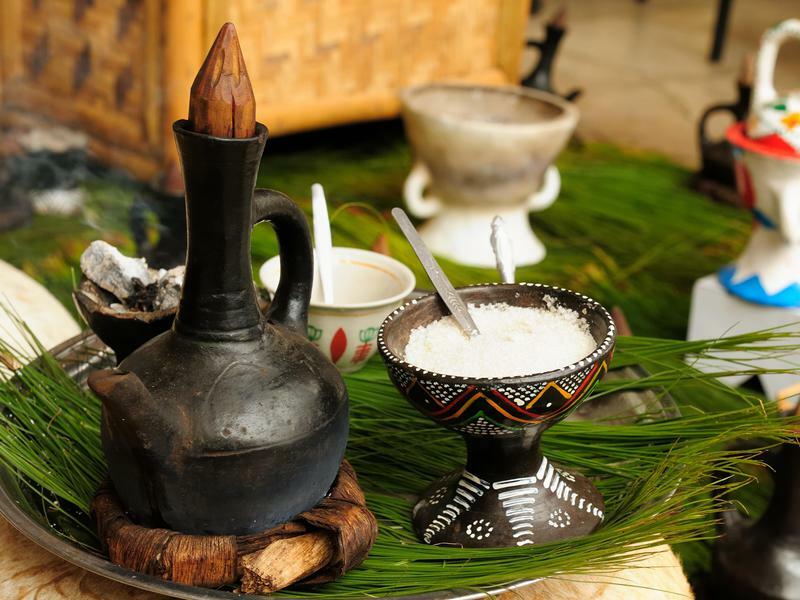 Both a spiritual practice and a social activity, Ethiopia’s elaborate coffee ceremony dates back centuries and remains an integral part of daily life. Traditionally, each ceremony lasts up to three hours and is performed three times a day. To begin, the woman of the house prepares the ceremonial room by burning incense to ward off evil spirits. Next, a jebena, a clay coffee pot, is filled with water and set on a pile of hot coals. The hostess then takes a handful of raw coffee beans, adds them to a large pan and shakes them over an open fire to remove the husks. Once clean, the beans are roasted and crushed by hand with a mukechawooden bowl, similar to a mortar, and a zenezena blunt-end cylinder identical to a pestle. 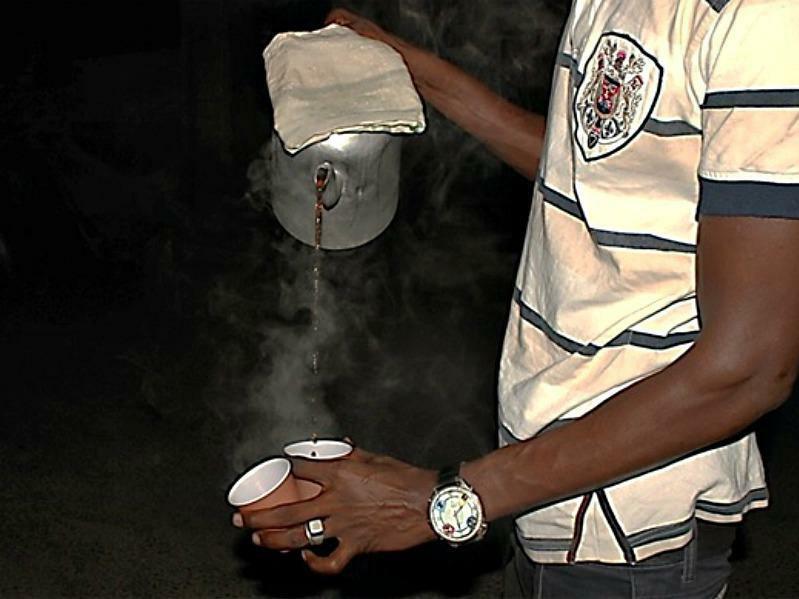 The grounds are placed in the jebena, now filled with boiling water, and once ready the coffee is served to the guests of the ceremony. The ritual is then repeated two more times. Imagine a world where workplace coffee breaks are mandatory. 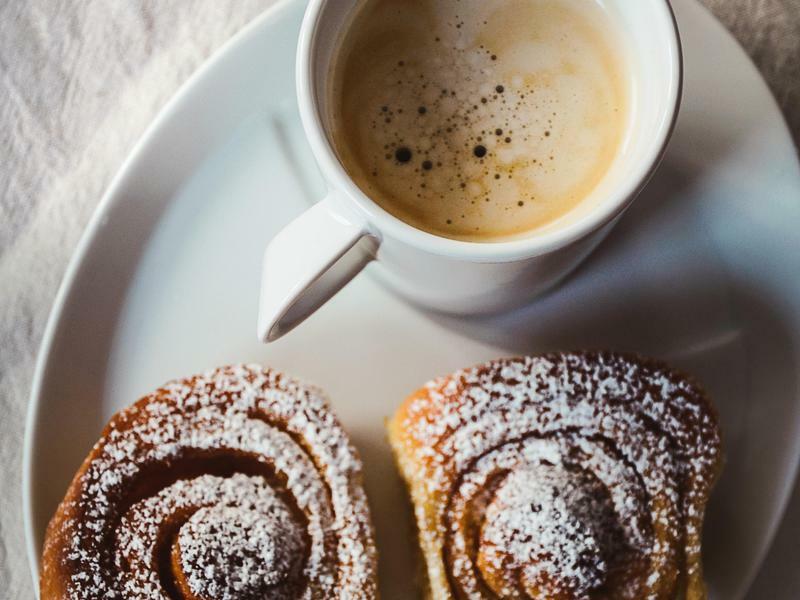 Where every piping hot cup of java is served alongside a flaky cinnamon roll, and where drinking 10-plus cups of coffee a day is considered normal. For coffee aficionados, there is such a place, and it’s called Finland. Recognized as the world’s top coffee consumer Finland is a place where locals refuse to live without their kahvi, even during times of war. According to one source, during World War II, when coffee disappeared, desperate yet resourceful Finns boiled pine bark, potato peels and anything else they could find to approximate a close-enough-to-coffee substitute. Luckily, Finland’s coffee coffers are beyond replenished now, and finding the stuff, even in the most remote corners of the country, is never an issue. And if you’re fortunate enough to be invited into someone’s home for coffee, it’s considered rude to refuse the offering. No matter how many cups you’ve already had. The heart of Austria’s coffee culture has been beating for over 300 years inside Vienna’s elegant, chandelier-lit coffee houses. It all started in September 1683 during the Siege of Vienna, when defenders of the city crushed the invading Turks of the Ottoman Empire. As the Turkish troops retreated, the Austrian forces swooped in and collected their abandoned coffee beans, along with other treasures. On that victorious day, Vienna’s love affair with coffee began, and coffee houses started popping up across the city. While most of the original cafes in Vienna have been renovated, many of the customs that inspired UNESCO to add the Viennese coffee house to the 2011 intangible cultural heritage list remain untouched. 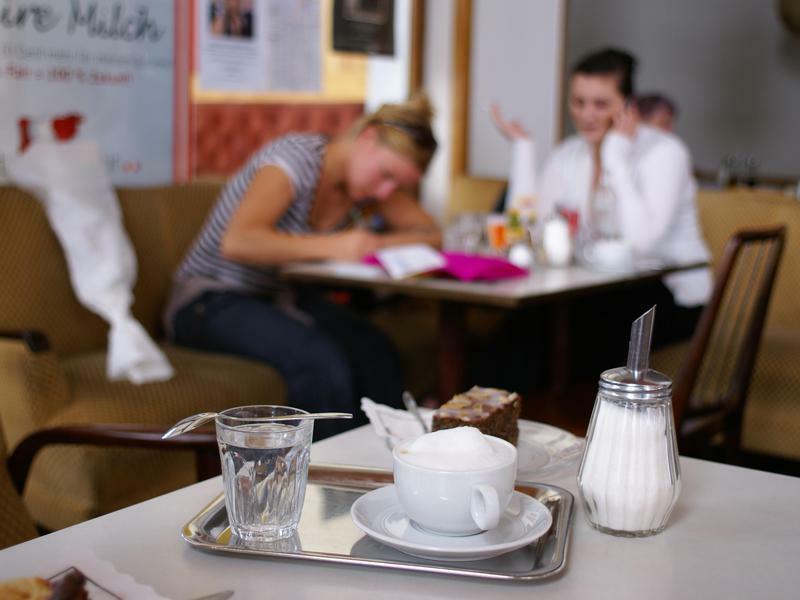 Locals still refer to the establishments as extended living rooms, where it’s okay to spend your entire day sitting, reading, nibbling on strudel or discussing the day’s news. The coffee itself, after 300 years, is still served on a small silver platter, with a polished silver spoon, a few cubes of sugar and a glass of water. Sheikh Ahmadou Bamba, creator of the Mouride Brotherhood and founder of the city of Touba, first introduced café Touba to the country of Senegal in the late 1800s. Initially, Bamba exclusively shared this coffee — which is boiled with Selim pepper, a warming spice — with his followers, who needed the extra energy to remain awake during long chanting sessions. Over time, the drink spread across Senegal, and today the people of this West African country not only enjoy it, but consider it a symbol of their identity and a staple of their culture. Much like Turkish coffee, Touba is boiled with cloves, sugar and Selim pepper. However, unlike with the Turkish style, the resulting brew is aerated by rhythmically pouring the coffee back and forth between two cups before serving. 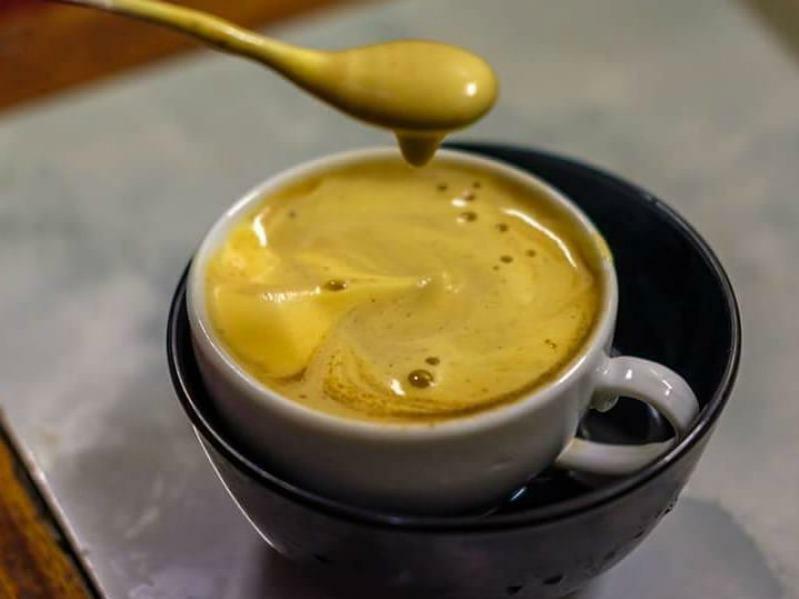 In 1946, in response to milk shortages triggered by the First Indochina War, Nguyen Van Giang, a bartender at Hanoi’s Sofitel Legend Metropole Hotel, began adding whisked egg yolks to coffee as a substitute for milk. Patrons of the hotel immediately embraced his creamy, caffeinated invention, and soon Giang opened Café Giang, where his infamous egg coffee, or cà phê trúng, became fixed in Vietnam’s coffee culture. In addition to whisked egg yolks, the modern version of cà phê trúng includes sugar, condensed milk, cheese and even butter. The result is a decadent coffee that has often been compared to tiramisu or a creamy Cadbury egg. McDonald’s is giving up the controlling stake in its Chinese business to a state-owned conglomerate as part of a global strategy to sell off more of its restaurants. Beijing-backed Citic and Citic Capital Holdings will take a 52pc stake in McDonald’s restaurants in China and Hong Kong, while US-based Carlyle Group will control another 28pc. The US fast food giant will retain the final 20pc as part of the deal, which it said was worth $2.08bn (£1.7bn). Sales in China were hit last year as protests were staged against US companies amid a diplomatic spat between Beijing and Washington over the South China Sea. McDonald’s has grown rapidly in China since it opened its first store in 1990, but is facing stiff competition from Asian brands such as Dicos and Real Kung Fu, which also offers noodles and rice dishes. The new Chinese investor group plans to open a further 1,500 restaurants in the country’s second- and third-tier cities. Experts claim a shifting diet towards burgers and pizzas has created an obesity explosion in China, particularly in less affluent inland areas. But the new consortium will aim to capitalise on growing demand among the middle classes for healthier fast food options. McDonald’s had previously announced plans for 4,000 of its global restaurants to be converted into franchises by the end of 2018. Ninety-five percent of its restaurants will be converted in the longer term, it said. This strategy enables McDonald’s to continue to take a slice of profits but cut down on operating costs. The company is also facing tough competition in China from Yum Brands, which owns KFC and Pizza Hut. Last year Yum created a new domestic business, Yum China, which plans to add 600 restaurants a year in China in the next five years. McDonald’s has more than 2,400 restaurants in mainland China and 240 in Hong Kong. The deal will see 1,750 being converted into franchises. Zhang Yichen, chairman and chief executive of CITIC Capital, will serve as chairman of the new venture. “McDonald’s has strong growth potential in the Chinese market,” he said. The deal will need to be approved by regulators in China but is expected to be completed this summer. Luke Mangan is the latest chef to enter the competitive burger sector, with the Chicken Confidential brand expected to launch in January 2017. The first location is slated for Sydney, however five outlets are expected to open across Australia, as well as further expansion plans across Asia in the next 18 months. From 7 to 22 December, Mangan – who also operates Hilton’s glass Brasserie – will give the restaurant’s lunch time bar guests the opportunity to taste Chicken Confidential’s chicken burger. Mangan operates 19 different restaurants across five countries as well as the food offering for Virgin Australia’s Business Class, on P&O cruise ships and on-board Eastern & Oriental Express. Chicken Confidential’s menu will offer fried chicken in a range of wraps, burgers and salads with the chicken supplied by Inglewood Fresh Organic Free Range Chicken. Mangan is joined by other leading Australian chefs also operating in the burger sector: Warren Turnbull (Chur Burger), Neil Perry (Burger Project), Shannon Bennett (Benny Burger) and Daniel Wilson (Huxtaburger). The Eurozone’s population and institutions may have been surprised by the outcome of the June Brexit referendum, but the economy has barely missed a beat as markets have snapped back after an initial slide, with Germany continues to lead the charge amongst major business travel markets in Europe. Consumers are consuming and businesses are hiring, investing and traveling for now. While spending has been somewhat resilient, measures of near-term investment intensions plunged in the third quarter of this year, suggesting coming weakness. Uncertainty: New waves of uncertainty may develop following the actual delivery of Article 50 as trade and immigration negotiations begin in earnest. Travel Pricing: The end of open skies for European air carriers may result in fewer flights and higher fares and reinstituting mobile roaming charges could expose road warriors to rising voice and data communication costs. Travel Friction: The debate over immigration could lead to extreme new UK visa requirements, which would likely be reciprocated across the EU. Coupled with rising security concerns in a new separated world, business travelers may face more difficulty and scrutiny moving throughout the EU. Access: The free movement of people and money throughout the EU brought many advantages for business travel. Going forward airlines may have to renegotiate routes and gates with both the UK and the EU potentially resulting in fewer flights and higher fares, processing and acceptance of credit cards becomes more complicated and the end of the European Health Insurance Card for UK business travelers could muddle health coverage during trips. Location Decisions: Establishing restrictions on the right for EU citizens to work in any member state will have profound longer-term impacts on business travel levels and patterns. The GBTA BTI™ Outlook – Western Europe report looks at the five largest business travel markets in Europe: Germany, the United Kingdom, France, Italy and Spain that together make up 70 percent of Western Europe’s business travel market, and serve as a strong indicator for the European business travel market more broadly. Western Europe’s business travel spending is projected to increase to $210.7 billion USD in 2016 and top out at $220.6 billion USD in 2017, 6.0% and 4.7% growth respectively – very positive numbers, but slightly lower than predictions in GBTA’s previous forecast. Germany’s economy remains one of the strongest in all of Western Europe fueled by a robust labor market, low interest rates, rock-bottom energy prices and strong demand for exports. GBTA projects Germany to continue to lead the growth in business travel spending from 2015-2017, with a 7.5 percent compound annual growth rate increase, followed by Spain (6.5 percent), the United Kingdom (4.7 percent), France (4.2 percent) and Italy (2.6 percent). Germany – German organizations continue to send more business travelers on the road as itcontinues to be the strongest business travel market in the region. Total business travel spending will increase 7.4 percent in 2016 and another 7.6 percent in 2017 reaching $73.4 billion USD. Domestic business travel will advance 7.4 percent this year followed by 7.8 percent in 2017 reaching $59.7 billion USD. International business travel will grow 7.3 percent this year and 6.8 percent next year hitting $13.8 billion USD. The United Kingdom – Despite the uncertainties surrounding Brexit, the UK’s economy and business travel market have not imploded as many critics feared. Next year will present more of a challenge from the UK’s business travel market though as the downside risk becomes more palpable with many firms likely to postpone or reduce investment, which could lead to a slowing economy. Total business travel spending will increase 6.9 percent in 2016 and another 2.4 percent in 2017 reaching $51.6 billion USD. Domestic business travel will advance 5.9 percent this year followed by 2.5 percent in 2017 reaching $33.5 billion USD. International business travel will grow 8.9 percent this year and 2.3 percent next year hitting $18.2 billion USD. France – While French business travel has not been quite as challenged as travel in its Southern Tier neighbors over the past few years, growth has been much less robust than healthier European markets. Total business travel spending will increase 4.1 percent in 2016 and another 4.2 percent in 2017 reaching $40.2 billion USD. Domestic business travel will advance 3.3 percent this year followed by 4.8 percent in 2017 reaching $25.9 billion USD. International business travel will grow 5.4 percent this year and 3.1 percent next year hitting $14.4 billion USD. Spain – Just a couple years ago, Spain’s business travel market was one of the most troubled markets on the European continent, but is now expected to experience one of the highest growth rates over the forecast period, second only to Germany. Total business travel spending will increase 7.2 percent in 2016 and another 5.8 percent in 2017 reaching $22.0 billion USD. Domestic business travel will advance 8.0 percent this year followed by 5.7 percent in 2017 reaching $17.4 billion USD. International business travel will grow 4.0 percent this year and 6.3 percent next year hitting $4.5 billion USD. Italy – Ongoing political turmoil, obstinate banking tensions and Italy’s sizeable debt will likely continue to hinder investment prospects and create a ceiling for business travel performance. Total business travel spending will increase 3.4 percent in 2016 and another 1.9 percent in 2017 reaching $33.3 billion USD. Domestic business travel will advance 3.0 percent this year followed by 1.8 percent in 2017 reaching $29.2 billion USD. International business travel will grow 6.4 percent this year and 2.7 percent next year hitting $4.1 billion USD.